Brendan Foreman wrote this review. The Chieftains were one of the first modern Celtic music bands. Although completely traditional in material and instrumentation (even to point of eschewing any guitar or piano), they were one of the first bands to present Irish music to an international audience as a serious craft, whose still-quite-living tradition demanded serious attention. Paddy Moloney — then a founding member of the influential (and much larger) Irish group Ceoltoiri Chualann — formed the band in the early Sixties as a compact ensemble of Irish musicians showcasing purely Irish stylings. For their 1969 release Chieftains 2 , Sean Keane, another fiddler, joined the line-up. With two fiddlers almost always playing some sort of back-up, this gives the music on this album a slightly fuller sound. In fact, the arrangements here are more sophiscated as the Chieftains began to utilize more effectively the multi-instrument nature of their group. This is evident right from the very first track, a set of the jigs “Banish Misfortune” and “Gillian’s Apples,” which starts with the beautiful intertwining harmonies of a trio of tin whistles. Later, in another amazing arrangement, Paddy Moloney combines four tunes — “Fiach an Mhadra Rua,” “Nead na Lachan sa mbuta,” “The Foxhunter’s Jig,” and “The Foxhunter’s Reel” — into an exciting set called “The Foxhunt,” which simulates the barking dogs, galloping horses, and sounding horns of a real fox hunt. Just to point out a few other notable tracks (among a whole album of notable tracks), “Bean an Fhir Rua (The Red-haired Man’s Wife)” is a slow graceful air, beginning with Paddy Moloney’s lone pipering and building into a full ensemble piece. The dual fiddles of Fay and Keane make the pert, good-natured Turlough Carolan tune “Seoirse Brabston (George Brabazon)” sound as if there were a few orchestra playing behind it. Another tune here, a plaintive air called “An Mhaigdean Mhara (The Sea Maiden),” caught the ear of the late Stanley Kubrick, who used it in his film Barry Lyndon , as well as some music written by the Chieftains specifically for that movie. The strident “Brian Boru’s March” features some almost Scottish-sounding pipering from Moloney. Like their first album, this one ends with an exciting ensemble set, this time featuring only polkas: “Sweeney’s Polka,” “Denis Murphy’s Polka,” and a rowsing “The Scartaglen Polka.” Also, like their first album, we are treated some fascinating liner notes, this time written by Sean O’Baoill, who details the history of many of these tunes. There is also this sweet, little note by Alun Owen: “In the last couple of years my most constant musical delight has been playing The Chieftains’ record, now I am going to be able to add another of their records to my collection. I am delighted, and await the next.” Fortunately, we don’t have to wait as long as Owen did; we can just pop in the next CD. There are two Carolan tunes here: the regal “Carolan’s Concerto” (or, more accurately, “Mrs. Poer”), which sounds almost like an Italian baroque piece with its intricacies, and a march-like version of “Tiarna Isne Chaoin (Lord Inchiquin).” To shake things up a bit, Moloney places a mazurka (another song type, like the polka, that Ireland borrowed from Central Europe and molded into something completely different) — in this case, “Sonny’s Mazurka” — with a slip jig “Tommy Hunt’s Jig,” giving the entire track an appealing, slightly off rhythm. They also syncopate the jig “The Trip to Sligo,” making it feel more like a slip jig. For a couple of tracks, the Chieftains bring in a vocalist Pat Kilduff to “lilt” the melodies. Lilting is a traditional technique of vocalization in which the singer imitates the sound of the fiddle. It’s a remarkably pleasant thing to listen to. Here in “The Hunter’s Purse,” Kilduff manages even to vocalize the various bow strokes. Later, he presents the slide “Merrily kiss the Quaker” in the last track. With harper Derek Bell joining up for the 1973 release The Chieftains 4 , the line-up changed once again. Although he shows up in this recording only as a guest musician for a few tracks, Bell would become a permanent member soon after the release of this album. Among the tunes that he contributes is the liltingly beautiful Carolan tune “Morgan Magan.” Here Bell’s harp provides a very satisfying backing bass line as well as the melody. Immediately following this, is a very pretty harp-and-whistle duet, “The Tip of the Whistle,” so named by Paddy Moloney who couldn’t remember where he heard the tune from or who wrote it. Moloney continued his innovative arrangements on this album with “The Battle of Aughrim,” a musical interpretation of the battle from the eerie calm of the beginning to the heart-riveting climax of the fighting and finally to its lamentful end. The piece resolves with a rather gay rendition of the reel “After the Battle of Aughrim” played over a strikingly discordant counterpoint on Moloney’s pipes. Although all of the Chieftains are involved with this track, this method of musical story-telling has apparently been a traditional style for the Irish pipe for many centuries. For an excellent assortment of really great Irish music, this set of CDs really cannot be beat. 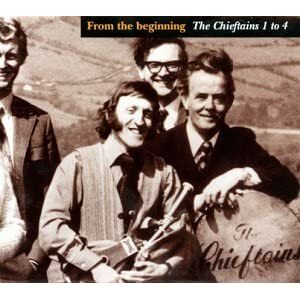 Each clocks in at about 40 minutes, which means that the Chieftains packed their LPs as much as possible, and which also means that there are many other gems on these CDs that I’ve left out in this review. But more importantly than that, these CDs provide a glimpse into the developing interest for Celtic music in the early Sixties that would develop to the semi-major industry that it is today. And this set is indeed a testament to these remarkable artists that, rather than change their style to fit the supposed needs of the worldwide audience, this band just kept playing the music they loved until that worldwide audience changed to fit their style.